The every-so-often Dorothy Chandler Pavilion party will include DJs, interactive art. The every-so-often Dorothy Chandler Pavilion party will include DJs, interactive art. The fun starts late, at 11, on Friday, March 24, and ends around 3 a.m. on Saturday morning. What exactly do you do when you're sleepless? You might try a breathing exercise, while remaining in bed. You might get up and go in search of a glass of milk. You could count sheep, perhaps. Or you could don some stylish togs, phone a pal, and make for downtown and The Music Center's late-night happening, the one that pops up every so often with style, art, and flair. "Sleepless" is its don't-nod-off name, and it is back, with sheer fabulosity, on Friday, March 24. There've been a few Sleeplesses over the last couple of years, and if you've been, you know it is one of those rare events that begins during a particular calendar day and ends in the next. Keep in mind, then, that March 24th version of Sleepless, which deals with the theme of renewal, revs up as much of the city is revving down, at a half hour before midnight. And says adieu, and good morning, at 3 a.m. on Saturday, March 25. How will that theme of "renewal" as well as "spring" and "migration" be expressed? The activities and presentations will center on a slew of spring-like sweetnesses, from the making of flower crowns with The Crown Collective to the folding of origami cranes for a time capsule. A "buzzing nighttime garden" sound experience is also on the docket, and the chance to "Talk to a Plant." A dance party, bean bag lounges, discovering more about how dates grow, DJs, and other effervescent doings, doings as bubbly as a vernal pool, will fill the wee small hours. You can, of course, sip that milk, and do breathing exercises, if you're feeling sleepless and wish to return to your pillow. 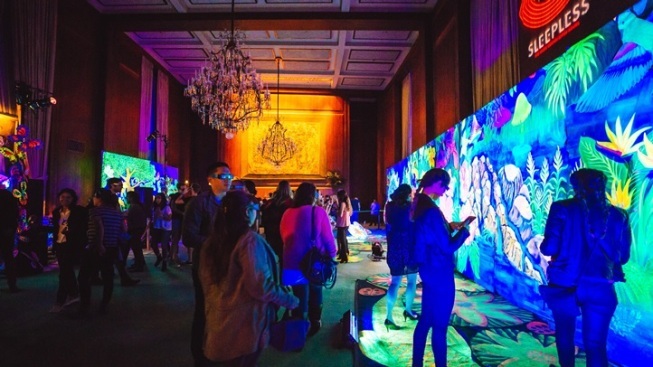 However, if you're more on the Sleepless side of things, and want to dip into a number of stylish activities spread out through the Music Center Plaza and Dorothy Chandler Pavilion, plan to be downtown 30 minutes before midnight on Friday, March 24. Wear your flowery dress or necktie or a full-on flower costume, complete with petal-laden hat, if you have such a get-up and haven't had a chance to try it out yet. This is, after all, the moment for blossoming. Tickets are $20 ahead of time or $30 there.